Chamber member Provides Employment for 75 Healthcare Professionals. Ballymena based Knockdene Healthcare Ltd was established in 2017 specialising in the supply of Nursing and Care Assistants within the Healthcare Sector. Having completed the Mid and East Antrim Borough Council funded Go For It Programme and Micro Business Programme with Ballymena Business Centre and locating their offices in Ballymena Business Centre Town Hub this company has gone from strength to strength. In less than 2 years trading Knockdene Healthcare Ltd is employing 75 Healthcare Professionals and has expanded their Ballymena Office to town centre premises on Castle Street, with a second office planned for Belfast soon. Tom Wiggins, Business Development Manager, Ballymena Area Chamber of Commerce and Industry said ‘ I remember sitting in Ballymena Business Centre in 2017 and listening to the plans that Eileen and Ciara had for Knockdene Healthcare Ltd. I am delighted that those plans have come to fruition. As a Chamber we are proud to support both established and new businesses. Knockdene Healthcare Ltd is a fantastic example of entrepreneurs who know their business, are confident in their product or service and are willing to invest the hard work necessary to make that business a success. 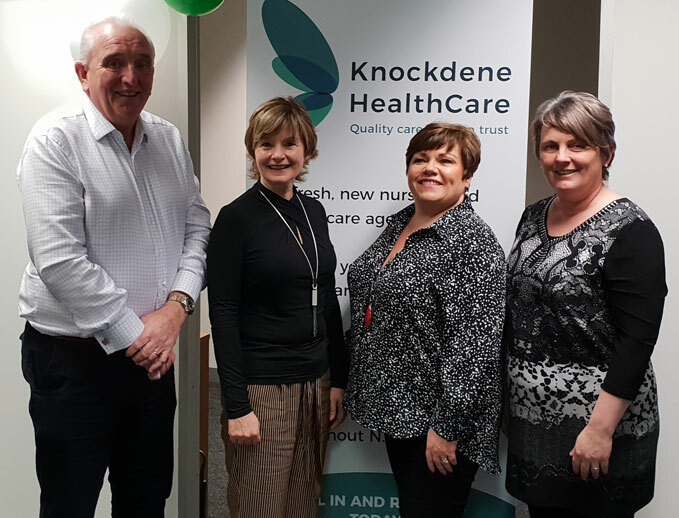 The success of Knockdene Healthcare Ltd shows that the economy in the Ballymena Area is vibrant and as a Chamber we look forward to working with Eileen and Ciara to ensure the continued success of their business’.